York Kenshinkan Karate Club have kindly invited our members to join them on Tuesday Night - 10th February at their dojo - 7 to 9pm and I suspect the customary small shandy afterwards. If you would like to attend or would like more details just drop me a line. 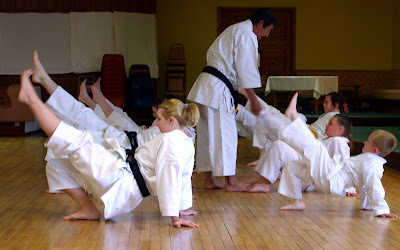 Above : Sensei Nenov performs Rantai with Asai Shihan looking on. Sensei Nenov from Bulgaria has sent me details of the above competition over the weekend. 24-26th April 2009. I seem to remember Sensei Helen following Sensei Nenov instruction very closely in Italy last year. I think she was checking out his technique? If anyone would like further details of the course just E mail me using the link in the sidebar. Are you ready to train with Sensei Kagawa? Let me know if you want a lift to Nottingham. Sensei Scott Langley has kindly invited members of our dojo to join the JKS, training with Kagawa Shihan 8th Dan JKS in Nottingham. I last trained with Kagawa Shihan in 2004 and will not miss the opportunity to train again. If you are interested in joining me, please let me know before the end of January, our places will need to be booked and a deposit paid. There is training on the Friday night, Saturday and Sunday, preference will be given to karateka that can attend the whole weekend. Sensei Kato is coming to the Selby Dojo at Barlby High School on Saturday 21st February. It has been well over 10 years since he last taught at our club. It is a great honour for us to host him and we would like all our members to make their best effort to attend the course. All Selby members please let Paul know ASAP if you intend to attend &/or grade. 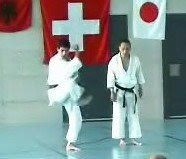 Asai Sensei "Open Hand Blocks"
Sensei Andre, many thanks for sharing another video of Asai Sensei with us, Osu! I have added a couple of videos of Hyakuhachiho the older more traditional name for Hyakuhappo. I have also posted a video of Suparinpei a similar Goju ryu kata which appears to have shared foundations? I seem to remember something about Hyakuhachiho being a 27th kata? For 2009 I have ambitions both for our club and for myself. Andy and I want to actively develop the club during 2009, it will mean a fair bit of background work, but I hope by the summer you will see a few changes for the better that will benefit all of our members. I also have personal goals where I want to apply myself fully to my Karate, where my body can't keep up I want to apply my mind a little more. The training started tonight with Sensei Helen doing a longer than normal warm up session. followed by some pad work and shuttle training. There was no heating on and the school was freezing! Sensei Andy followed this with some Kihon training, just 6 weeks to gradings so we had all better start trying our best. At 7pm most of the lower grades leave and we have another 90 mins training left. I had spent some of the afternoon thinking about kata and I wanted to do something that would make some of the other Brown and Black belts think as well. I took chunks from a few higher katas and got the brown and black belts to demonstrate them and then the class from purple belt up had to imitate 3 time to count and then 3 times no count. It is not always easy being asked to start in the middle of a kata. Dom on again with Nijushiho- from the sukui uke, yame teisho through the first Kia and the next 2 moves of the collapse and strike. At this stage I could see the class not quite sure where this session was going??? Helen was back on again Nijushiho - but this time the last few moves from kiba dachi through the sanchin dachi movements. Dom again with Empi - The sukui uke followed by the 3 steps double teisho, gedan bari, yame zuki, jump and two shutos. Where is this all leading to??? I did the Meikyo bit - from the bo uke, driving forward turning and stepping into Kida dachi. Next Sam was up, Bassai Dai - from the Miki Zuki Geri through to the end of the three Yama Zukis. I then got Sam to do just the three Yama Zuki in Kiba dachi where we left off from the Meikyo sequence. We then recapped all the snipts of the Kata we had just practised and came to Yoi. The start of Meikyo, the feel of Chinte, the double punch of Empi, the crane stance sequences followed by the open hand strike of Kashu, the collapse and strike of Nijushiho followed by the last move in sanchin-dachi. The transition in Empi before the jump followed by the Mekiyo bit pushing forward and turning followed by the 3 Yame Zuki punches. A few more shutos, nukite and a 360 degree turn and step back finishing with a final shuto and we are all done! I went on to break down the kata and teach it in a bit more detail, Sensei Andy reminded me about a few of the details that I had not retained. The third Hiato mawashi uke finishes Migi sho facing down all other sho movements are palm up. Most of the punches are Tate Zuki and Andy also thought that the 4th move the hands are sho not Ken, I am sure he is right? Even if the body is tired after Christmas I was happy with my reconstruction of the kata, I hope the class was too?